Two boys grew up together both give their hearts to the Lord while young, one believed in 'once save always saved (Tony)', the other did not(Mike). Both loved the Lord Jesus and did what they believed to be right. They both believed that if you truly loved God you would not sin! Mike had a lot of trials living the Christian life and backslide he knew he was living a life that was contradiction to The Word of God yet he continued on this path to destruction. Tony on the other hand stayed true to the word of God believing He was alright because he was living as a christian should because he knew he was fully saved. Both died and faced God in judgment Mike faced God first and was told you knew to live a life that was pleasing to me but you decided to walk in your own selfish ways so depart from me to your just punishment. Tony was next to face God and he was told to enter into the joy of the Lord. Tony asked God why am I allowed to enter and Michael condemned I believed you were a loving God and when we accept you we are guaranteed a place with you in the kingdom. Jesus replied in my word it says you must be doing my word to enter my my home, but your word says its by Grace were saved not by works Jesus replied if you love someone on earth you would go out of your way to show them I died for mankind that's how much I loved them. If love does not produce an action then its not love, its like the salt that lost its flavor. and in 2 Peter 3:18 it talks about growing in grace. 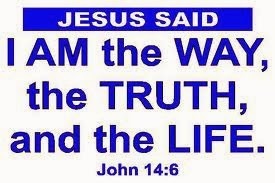 It seems that people think GRACE is a licence to sin but in fact its the opposite, Grace and Truth came by Jesus Christ John 1:17 Jesus never said don't worry about you sin God understands no! he said 'Go and sin no more! Our trouble is we like sin but if we resist it the devil will flee James 4:7. Some people cannot stop sinning and constantly struggle with sins of the flesh, if this is a problem which you cannot overcome seek a church with people who have experience with your situation never give up or feel ashamed about our problems pray to God for people who you can trust to pray with you, so you can be the man or woman of God he has called you to be. Don't take the chance thinking all is okay because you were dedicated or baptized as a baby thinking it will get you into heaven, there is no entry with out the key which is in Christ Jesus. Please check out my other blogs where I explain more about Gods Grace and Love. I'm not trying to say to people its no good being a Christian because I can not live as Jesus. The whole point of being a Christian is allowing Gods Spirit to live in us and through us. I believe once saved always saved as long as we live according to the word of God through The Holy Spirit. This is an excellent film showing how all different races of people can share life together, without any discrimination. That is how life should be, where we learn to work together as one human race! Trials and temptations come to us all, we need each other to get through the good and bad times. It's a shame families cannot even show love towards one another! If you think this is a false statement look at the divorces rate in the 'churches' and children who have no respect for their parent or adults. Its not all doom and gloom if we taught our families and prayed for the government and lived lives that were pleasing to God there would be a change. Sam Cooke penned a song called 'A Change is Gonna Come' we are on the edge of a move again, where the church is getting it's self right with God! I believe its gonna bring a separation between the true Christians and anything goes Christians, so we need to know our personal walk is right. Its not about taking the mote out of my brothers eye, its about my personal relationship with the risen Jesus Christ. Look at the films, coming out of Hollywood it can be seen that the world is moving towards a Spiritual wake up. Too much second hand rubbish is being preached! By that I mean sermons that have been 'copied and pasted' rather than birthed out of prayer and waiting on God. This film will give us an understanding about helping people, as the good Samaritan did, its would be good if we didn't judge people by what we see! but as Martin Luther King Jr said by the content of their hearts. This is a well thought of movie its not what some people might see as a true christian film but it deals with real life issues. Jesus said we will be know by the love we have for each other! 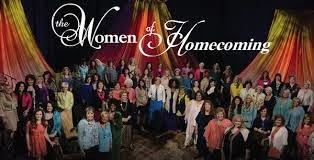 Bill and Gloria Gaither recently released 2 Women Of Homecoming CD & DVD. The Gaithers are knows for their song writing and Campfire style gathering. On their DVD you usually have mini interviews and and the history of the songs, which bring a reason to the song. Vol 1&2 are no exception the Spirit of God is moving throughout the sessions, there is something special when women who love God start to worship the lord in song. From the youngest with a pop worship style to country music you will be moved and blessed! The King Is Coming etc. They have been anointed to bring music straight from the Throne room of God, what a blessing they have been to our generation. This is a quality product as usual from The Gaithers, its easy listening pleasant on the ears its good to see old and young mix it with love and compassion in their music. If you want to bless someone for their birthday or mothers day this would be a perfect gift. A friend of mine who is a Muslim, not a convert he was brought as one in a muslin country belonging to a muslim family. We talk without arguing, about our faith I have read the Quran because its not good to be ignorant about what people believe. My main point, when we speak, is that Christians have a second birth, it comes from God, as we are born again through The Holy Spirit. That is what separates us from every religion, wen have our relationship through Jesus Christ! The bible teaches us that 'Flesh gives birth to flesh that's the natural man and Spirit gives birth to Spirit John 3:3. Unless we have the 'Born Again' experience we cannot even see the kingdom of God! How are we going to affect the world for Jesus Christ if we are walking just like the world! I'm not saying that we can walk sinless, no I'm saying confess it to God repent and move on, don't dwell on it. We do not receive because we don't ask don't stay in condemnation. Some churches teach its okay to walk in sin, others teach there is no sin any more Jesus cancelled that out when He died on the cross, (why did Jesus say pick up your cross daily?) . I did a blog and titled it ' What is the world coming too!) maybe I should have named it what is the church coming to! There is a book called 'The Calvary Road' by Roy Hession it is a powerful book George Verwer gives these books away, if you ever get a chance to see him, or you could contact him. He sent me a copy, it will really bless you and stir you up into walking the true Christian life. It gives practical advice about being a follower of Jesus Christ. Jesus said to His Apostles make disciples, these are people who are willing to give up all to follow Jesus. This is why Jesus talked about counting the cost, not to put people off just to let us know that trials and tribulations come to test us, to see what we are made of. Will we stand strong of fall away. Our problem is people or peer pressure! no one wants to look bad our ego's are too big and we don't want to hurt them. You don't expect me to say I'm wrong or sorry do you! Pride has turned many to the broad road! There a song which simple says "I'd rather have Jesus than silver or gold" how many of us would really look deep in our hearts and agree with that statement! How many of us would really be willing, if so be it to give our lives for our faith in Jesus? Do we put Jesus before family, or do we say it, because it sounds good! God help us if we are here in what the bible calls perilous times. 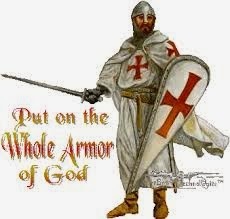 Ephesians 6:11 put on all the Armour of God to me this means we need to be ready as soldiers of Jesus Christ, when people of other religions see up let them see Christ in us by showing love for each other. A side note we are all called to be part of Gods army in some way, from supporting the gospel to preaching! What a blessing it was to be at the launch of Love Wales, Jesus said in Acts 1:8 First in Jerusalem which was where they were! Its time for us as Christians to be a light where we are. Marilyn Harry who what she was doing a 'Bread and Fishes' ministry do what you can with the little you have we serve a big God who will multiply what we give. Marilyn is truly a woman of God who has been commissioned by The Holy Spirit to help Re-Evangelize Wales to prepare us for the coming revival. The main speaker for the launch was my friend George Verwer a man who is full of vitality, I don't believe a person will want to sleep when George is speaking, His lessons from life are real no pretense! He just says it as it is. With a wealth of experience to be gained its always a blessing to be hear George. to see people operate in their calling. I thank God He has put me in a position to meet people who are on the forefront of what God is doing. Not forgetting the people and churches who supported this event check out the link regularly and find out what we can do do be involved with bringing the gospel back to this land or wherever you are. 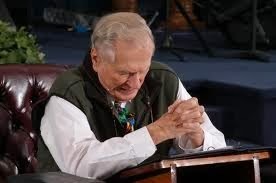 Prayer is a key to revival and it is important to remember that millions of people who are not celebrate or acknowledged here will have greater rewards in Heaven! I attended Geoff workshop on knowing your position in Christ where he mentioned that we are seated above all demonic spirits as Christians we do have the power through Jesus Christ to change the world. My prayer today is Let me be a world shaker for you Lord Jesus! This was first said in Joel 2:28 then repeated by The Apostle Peter in Acts 2:17 it is a promise from God to us God will touch us. This is a time that the church has been waiting for (I'm not specifically talking about the church as in a building) but as the sons of God that have been preparing themselves. Jesus is coming for a spotless bride so we need to be right. How can this be I fail God so much when Jesus died on the cross He sent up the Holy Spirit and if we yield to him and give him total control He will move on us. So are we ready for the next move of Gods Spirit in Wales I don't think so but the few that are ready for what God is about to do could spark the much needed fire. 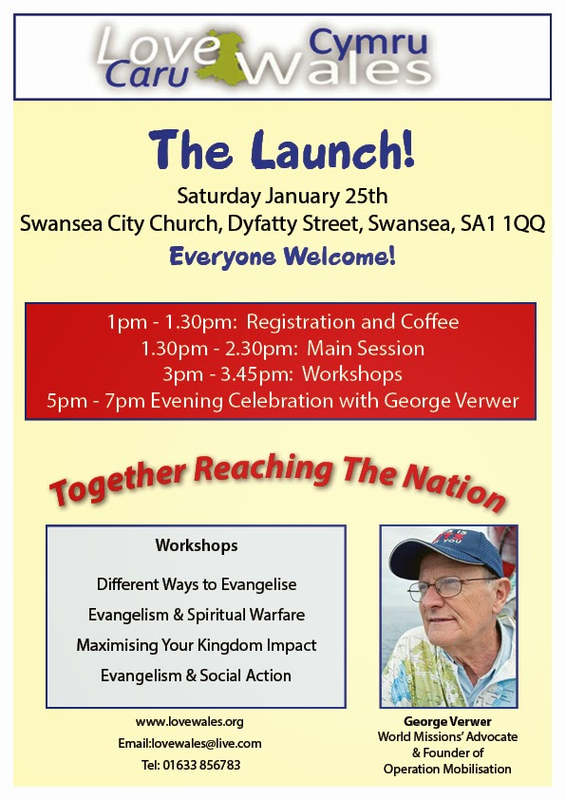 George Verwer will be speaking at The Love Wales will have its official launch this Saturday 25 January 2014 I believe if the Christians got behind this project it could shake the nation. The aim is to bring Wales together as one! Whenever true revival starts denominational barriers break down, and people start to move as The Spirit of The Lord Jesus Touches them. 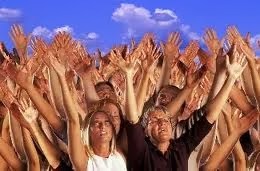 Most people haven't seen revival this is why when ever theirs a stir people shout 'Its a revival'. First of all revival is not man made that's religion. Secondly when real revival starts people know it, not everyone agrees with it because of our fleshly thoughts. Fourthly recession does not affect it but true revival affect the economy. These are just a few pointers from reading about past revivals and what The Holy Spirit has ministered to me. Wales was known as The Land of Revival and I'm 100% sure were due another in my life time, could this event be the start of what Wales has be praying for only God knows. I have an excitement about this year, believing it to be significant on his calender, the bible teaches us that God is looking to show himself through people who are yielded to Him 2 Chronicles 16:19. An encounter with death from an orthopedic surgeon who came back from the other side to share what she experience. We are in a time where many people are having whats been called Near Death Experience or NDE's, some people thing when you leave this body its the end of everything. Your body expires so do we!, others believe that our spirit or soul occupies this body while we are here on the earth. Whatever your reason for your belief, if it feels right to us 'its okay we can justify what you believe, and give it no more thought. It does not matter if what we believe is true or not 'The Truth Hurts' so often and we don't like to be hurt why should I think there could be a punishment for living a selfish like I can do what I like who are you to tell me what's right or wrong. There is a good answer which is found in the Bible which simply says 'Do to others what you would like to be done to yourself' Luke 6:31. Is it possible to know what is real, does God know us well enough to know what we need as individuals? For me to believe it has to be real, in other words it has to be proven in some way to make some sense to me without a shadow of doubt. I'll put it this way, no one cannot see gravity, but it can be proven by jumping up the air because its what pulls us back down. Therefore I don't dismiss it because I can not see it! There are too many proven cases to dismiss that our spirit will not go somewhere when we leave our body. Scientist and numerous medical doctors have been calling this a new science. There is a famous case where a lady was pronounced dead and she came back to life with a strange story, about leaving her body going through the hospital roof building, she described things she saw on the building in her description she mentioned a shoe on the roof and describe where it was, its condition and colour in vivid detail. This helped to solidify what is now called NDE's phenomenon. In Mary C Neal MD book, 'To Heaven And Back' you can get a feel that she is very serious about life and doing what must be done with determination, work before play as they say. My only disappointment while reading the book after watching some of her interviews was that Jesus was not emphasized or lifted up much, especially because she was a Christian before the NDE and she knew her encounter was with Jesus. One interesting thing I like most the book is the way each chapter starts with a famous inspirational quote to introduce the chapter from Helen Keller to Martin Luther King Jr to Corinthians in The Bible. All that is cleared up in her Question & Answer session at the very end of the book. It is an interesting read I think it would be a good gift, for non christian, because I think it would interest a lot of professional people who think Christianity is for weak people with no ambitions. My prayer for today is to allow people to be inspired by whom you choose to spread your word. 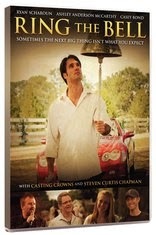 Today I watched a movie called 'Ring The Bell' this movie pulls at your heart strings. A well respected sports agent leaves town to sign, futures baseball star in the country. 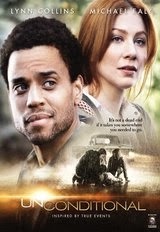 This movie will touch your heart and make you think is your walk with Christ true. For me the most outstanding part of the movie was the focus on the way young people as individual dedicated their lives to whatever Jesus wants them to do as Jesus prayed "Not my will but Thy will be done"
Its not what people think about you but am I doing what God has called me to do, if I am then I don't need to worry what people think. There is also a special guest appearance of Casting Crowns where a call to Christ is given. An excellent film suitable for all the family, and it's also a good witness. Video sample available to watch and purchase. Did Jesus Really Teach That? There is a way that appears right to a us but usually is our own selfish way! Proverbs 14:12 I just paraphrased the verse. 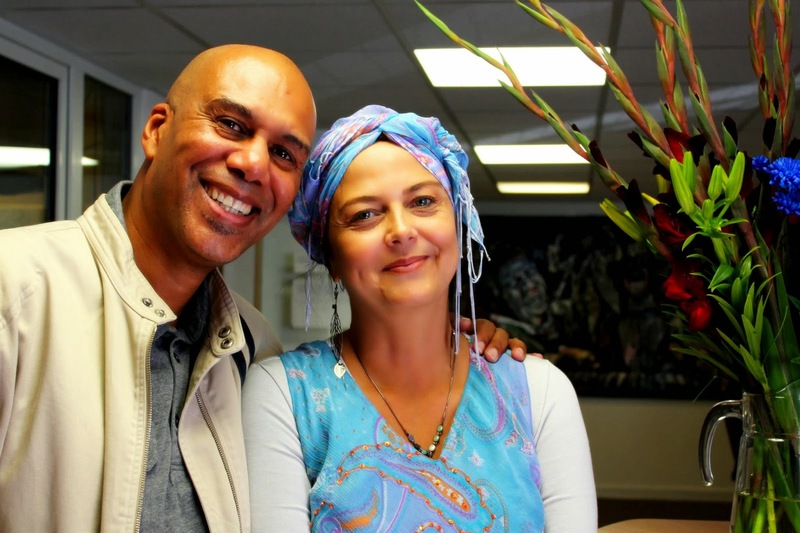 Sunday Morning I was speaking to my good friend Stephen Johnson, while he was presenting his show The Lime, he related an incident that happened to him while he was riding his push bike. A motorist deliberately run in to him. It's dreadful to think that a person would do something like that, for no apparent reason! What is even more astounding was that while he was down and bleeding nobody stopped to help! Hence my title 'What Is The World Coming Too' what kind of world are we living in, when I was a child in my hometown of Cardiff it was very rare to hear of a fight where a knife was involved, but nowadays gun crime is a common thing. Even the word sin and repent are not being used much any more, the bible teaches if the righteous scarcely be saved... 1 Peter 4:18. It is strange when I hear people from different religions talk about their god, they cannot understand relationship with The God who created the heavens and earth. Dead religion cannot save anyone! To follow a religion just because your parents follow one is foolish. There is an old saying 'God has no grandchildren' how true this is. I'm not saying don't bring up your children to know God. It is important to do this, we need moral instruction, what I am saying is we need to know God for ourselves as a father and friend. Many Christians grow cold with age but the bible teaches us to go from 'glory to glory' 2 Corinthians 3:18, of course I am including myself because we go through what we call wilderness periods. What I have come to realise is we sometime stay in the wilderness too long. Jesus was moved by The Holy Spirit to spent 40 days in the desert before He started His ministry, Jessu constantly communed with God for direction, according to His own words in St John 5:19. This morning and last night this phrase came to my spirit 'Seek God With All Your Heart' its from Jeremiah 29:30, we find the words "You will seek me and find me when you seek me with all your heart" . In my communion time this morning I read the answer given by Jesus in Matthew 22:37 which states Love the Lord Your God with all your heart and with all your soul and with all your mind! Sometimes its seems that our burdens are too heavy for us but if we just keep trusting God and trusting we will get the answer, if it seems that the answer is not coming just keep praising God He will not let you down. It might be easy for someone to say it will be alright in the end. While we live trials and sickness will come to us or people we know, but this I can say without a shadow of a doubt 'If we are living as we should without unforgiveness, anger, bitterness or strife etc in other words showing the love Jesus demonstrated then as the bible stated in Romans 8:28 All things work together for good to them who love The Lord and are called according to His purpose. Everything we need to live the Christian life is in the bible as long as we stay sensitive to The Holy Spirit who always says what Jesus says. To love Jesus is to share Him with the world or in your circle. My prayer today is to stay focused on the work you have me here for and to finish the race and Jesus say to me well done my faithful servant. I have been seeking God for a deeper relationship, in the area of communication. 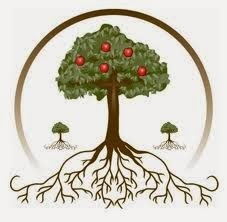 It mentions in St John 15 about being in the vine, this is a metaphor or in other words connection to God. In the same chapter verse 7 it say's "If you abide in me and my words abide in you", So there is a relationship where words should be exchanged. This morning while I was in my time of worship God He dropped in my spirit a time when a friend of mine was staying with me and The Spirit of The Lord was upon him and started to commune with him, I asked him what God was saying to him one of the phrases he quoted was James 4:8' Draw near to God and He will draw near to you', there is another scripture which came to me this morning also which is found in Matt 6:33 it simply says See first the Kingdom of God and His Righteousness and all these thing shall be added unto you. I was encouraged when I received this revelation this morning, it clearly let me know that all we need to do is to keep seeking God with all our hearts and he will answer. As our relationship we will walk constantly in fellowship with the Lord Jesus. So My prayer today is Drawn me closer to you Lord! When I was a child my parent's taught me to love and respect everyone! Sadly coming from a non indigenous people of the UK, we were ostenized. This really was a foolish thought of a young child, because the truth is God so loved the world that He sent His Son Jesus to die in our place so we can enter Heaven. That's the beauty of it, no one has to go to hell. So many different gods too choose, but Jesus was the only sinless person who died for our sins. Jesus blood has the Power. I see it like this sin cannot stick to the blood of Jesus as the light dispels darkness in the natural, so in the Spirit Jesus blood blots out SIN, therefore sin cannot stick to the blood of Jesus, remember Jesus said The devil has nothing in Me! (John 14:30). Therefore we can walk in the victorious power of the risen Christ. 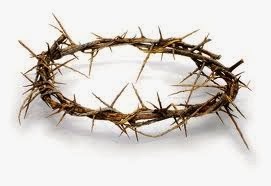 If what Jesus Sacrifice on the cross left us (his body) powerless whats the point in Christianity! My prayer today is to renew me lord Jesus blot out my transgressions, let people see you when they see my actions. A young girl who was brought up is an atheist home has been drawing pictures of Jesus from a very young age, and sold her first painting at the age of 7, Akiane has brought to the world an understanding that God anoints and gives gifts to whom he chooses. God uses the humble not the proud to show His glory, in that way it stops us as humans from trying stealing Gods glory. A friend of mine said to me, that an elder was upset with me because I said people must be right with God to be a christian. I did not understanding that we all sin and God will take His time to make us right. My reply was this, I know that we sin, that's why John wrote to Born Again Christians in the New Testament about confessing your sin as a Christian to be forgiven. If we teach new Christians that they can carry on sinning until Jesus does something about it that is giving Christians a licence to live in sin. When Jesus died on the cross he gave us power to overcome sin in our lives. Hence today's title 'Is Jesus Your Lord' if He was then the word Total Surrender would be what we aim to do each morning. My prayer is to let The Spirit of The Living God search me today so that I do not stray. That was before I had a personal relationship with the risen Christ. 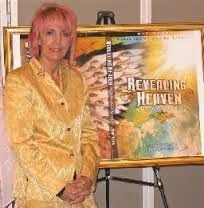 I have been listening to Kat Kerr latley, ( many other people who have died and been to heaven and hell) the revelation Mrs kerr reveals is what I call deep spiritual food. It is good to know that God loves us so much that he has prepared a place beyond what we can think or imagine. Second is that some people you expected to be there are not. And the third is the people you didn't expect to see are there. As Kat kerr states God is bigger than our box l love to hear Kat talk about her trips and what God is ready to do with his people here on earth.